Control & Data Log Your Air Sampling Event! 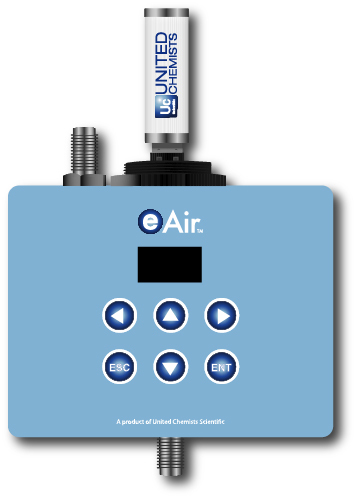 The eAir is the world’s first air sampling and monitoring device that controls the sampling and measurement of air, while data logging the entire event. It has been designed with plug and play sensor technology, rugged weatherproof enclosures, battery and solar power operation, and standard USB data storage. The data file the eAir produces is a spreadsheet compatible CSV file that accurately documents date, time, ambient conditions, GPS location, and up to 128 sensor options. The eAir is also compliant for use with EPA, OSHA, NIOSH, and ASTM methodologies. Our plug and play sensor platform is flexible, providing solutions for all air sampling and monitoring projects including: perimeter, hand held applications, summa cans, sorbent tubes, tedlar bags and most types of filter media. All you have to do is choose the flow, duration and volume of your sample. The eAir is capable of setting timers and triggers for sampling events. You can set timers to start sampling in the future, or set the eAir to trigger when a particular condition exists, like high VOC readings from the photoionization detector or when the wind blows from a particular direction. These innovations provide scientists with new tools to accurately sample and measure air. The results the eAir creates makes it easy to view, graph, and share results. And our free excel template, Airview 1.0 , automatically graphs this data, helps show trends, and makes a google map of your sampling points. The eAir’s new approach to air sampling and monitoring saves time and money, and at the same time provides scientists with new and powerful data.